Now that John Kerry has locked up the Democratic nomination for President, attention has turned to the person Kerry might choose as a running mate. The list of possibilities reads like a political who's who and range from Republican Senator John McCain of Arizona to former First Lady Hillary Clinton. But, the most popular choice among Democrats seems to be Kerry's former primary rival John Edwards. On the surface, these two politicians couldn't be more different. John Forbes Kerry, a Sagittarian born into a family of privilege, attended private schools, Yale University and was a member of the elite Skull and Bones Society (as was his rival, George W. Bush). After distinguished service in Vietnam, Kerry went on to co-found the anti-war protest group Vietnam Veterans Against the War. Later, he served as Massachusetts Lt. Governor under Michael Dukakis, who lost to the senior Bush in 1988. Kerry, who has been the junior Senator from Massachusetts since 1984, is seen as the epitome of Eastern liberalism and is viewed by some as a bit of an aristocrat. His marriages to not one, but two, very wealthy women only add to the perception that he is one of the "beautiful people." On the other hand, Edwards, a Gemini, is very much the quintessential self-made man. Born in Seneca, SC, Edwards was raised in North Carolina in a working-class family. Educated in public schools, Edwards worked his way through North Carolina State Uni-versity, becoming the first member of his family to graduate from college. He earned a law degree with honors from the University of North Carolina in 1977 and spent the next twenty years earning millions representing victims in corporate negligence suits. Elected to the Senate in 1998 when he defeated a very strong Republican incumbent, Edwards quickly emerged as a vibrant leader of the "new" South. A devoted family man, he is the father of four children, the eldest of whom was killed in an auto accident in 1996. Astrologically, Kerry and Edwards are very much like two sides of the same coin. Kerry's Sagittarian Sun is in opposition to Edwards' Sun in Gemini. Though both are undoubtedly brilliant men. Kerry's Jupiterian nature is that of the deep, intellectual thinker, while Mercury-ruled Edwards is more of a quick-thinking conversationalist, making it seem that he is more in tune with the pulse of the common man. Kerry's Moon in Gemini is conjunct Saturn, adding depth and weight to what would usually be a more easygoing, friendly Moon placement and giving Kerry a more serious demeanor. In contrast, Edwards' Moon, also in Gemini, is conjunct Jupiter, giving him a considerable amount of charm and friendliness and adding to his mass appeal. However, Kerry's Moon in Gemini is closely conjunct Edwards' Sun, making them natural partners and giving them the potential of becoming real friends. The two Senators also have Mercury in opposition to each other. Again, Kerry's Capricorn Mercury gives him a serious point of view. And, even though his initials are JFK, he just doesn't seem to have the charisma and gift for communicating that the other Senator from Massachusetts who became President possessed. As one Kerry supporter put it, "If you like Kerry, want to listen to him, then you will be inspired and convinced by what he says." Edwards, whose Mercury is in Cancer, has a softer, more compassionate communication style. But, don't sell Edwards short; underneath that sweet, good-natured exterior is one shrewd lawyer/politician. And, if this weren't enough, Kerry and Edwards also have Venus in opposition -- Kerry's is in detriment in brooding, intense Scorpio while Edwards is dignified in passionate and earthy Taurus. Kerry and Edwards have their respective Saturns in trine to each other, allowing them to work well together. Edwards' Mars sextiles Kerry's Jupiter, giving them the ability to combine their strengths for success. Edwards' drive and ambition is a great support to Kerry's grand plans for the future. Sources: John Kerry -- Astrodatabank reports from Kerry himself to astrologer Karen Thorne. John Edwards -- Astrodatabank reports from an anonymous Edwards’ staffer to Pat Taglilatelo and confirmed by Edwards’ mother. Kerry was born with the Sun rising and Neptune on the MC (when two planets are angular, it is called paran or an angular mundane square). Though these two planets are not in a traditional square aspect, they still act like one in Kerry's chart. 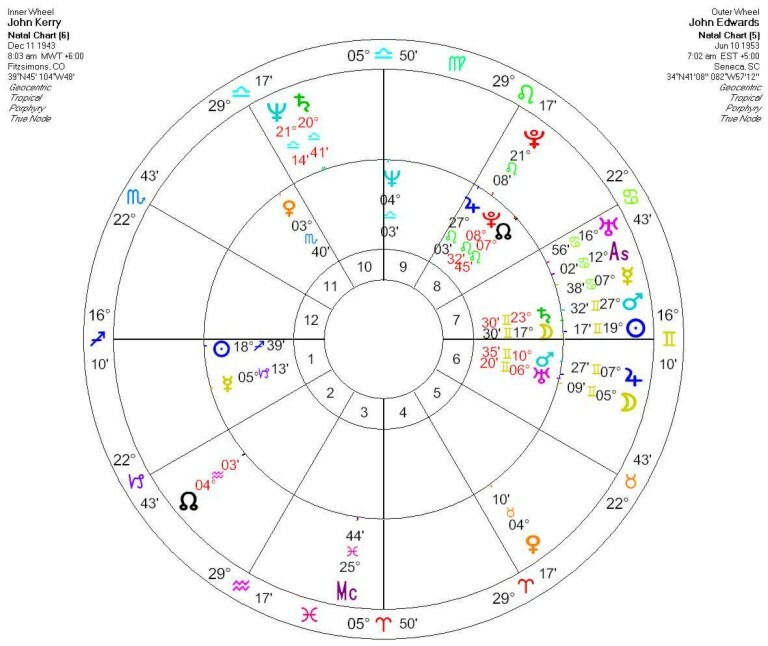 With the Sun rising, Kerry very much needs to be the center of attention while, at its best, Neptune on the MC could make him a visionary devoted to selfless service. At its worst, he could lack direction and be easily disillusioned. Ultimately, this combination makes him a target for the accusation that he is an ineffectual politician who casts his votes in the Senate based upon what is expedient at the moment. Edwards, on the other hand, has four planets including the Sun, Mercury and Mars in the twelfth house, giving him the ability to work well behind the scenes. Generally speaking, this also gives him the opportunity to get things done without as much scrutiny. Edwards also has a relatively easy trine between his Sun and the generational Saturn-Neptune conjunction in Libra, adding to Edwards' ability to be self-confident, responsible and sensitive to the needs of others. In short, John Kerry and John Edwards add their respective personal strengths to counteract each other's weaknesses and, together, would make a formidable ticket to oppose incumbents Bush and Cheney. Kerry's experience, ambition and money combined with Edwards' charm, good looks and compassion is a pairing that gives Democrats a strong hope of recovering the White House. With Edwards' Progressed Sun conjunct Kerry's North Node, an announcement could come at any moment that these two have decided to tie the knot and go down in history together, for better or worse.